As regular readers of my blog will know, I’ve been using Windows 7 on a dedicated Home Theatre PC (HTPC) for several months now. I’ve been occasionally tweaking things and I thought I’d share the power settings that I’ve got configured. As these settings are for a PC that does nothing but run Windows Media Centre, you may need to adopt a slightly different approach but I’ll explain my choices as I go so that it should be clear why I’m using a given setting. By way of an introduction, Windows 7 comes with three pre-defined plans: power saver, balanced and high performance. Balanced is the recommended plan as this gives the OS the most flexibility when it comes to changing the speed of the processor and therefore adjusting power consumption and heat output. I therefore took the approach of tweaking the Balanced power plan. Let’s go through each setting in turn. You may need to click on the + signs on the left hand side against a setting to expand out the view. Since my PC is dedicated to running Windows Media Centre, that means I don’t have a keyboard permanently connected to it and I therefore don’t need or want the added security of being asked for a password when the computer wakes up. Hence No as the value here. This is when the drives get turned off for being idle. To be honest, I’m not sure if my computer ever becomes idle because the internal drives are all configured as a single RAID 5 array split into the OS drive and the data drive, but 10 minutes seemed like a good compromise value if it should ever happen. As I always have Media Centre running, there is no need for the desktop to be running any sort of slide show, so I’ve Paused it. A bit of a strange value name, but the alternative is Available, which isn’t what I want. The network connection from my media PC to the house network is over wireless so I’ve set it to Maximum Performance. When the PC is on, I’d rather have throughput over power consumption. Now a whole bunch of settings relating to how the OS handles sleeping. These are likely to be the ones that cause the most aggravation and may deviate on your system if it isn’t just being used for Media Centre. The Sleep after setting should be fairly clear. I’ve set my computer to go to sleep after 15 minutes of inactivity, typically after a recording has finished or I’ve stopped using Media Centre. Now, Windows is actually pretty intelligent about when a computer is being used which means that the computer may not actually go to sleep when you expect it to. For example, although my HTPC is only used for Media Centre, that isn’t quite the full story. I do also use it as the home file server. Why bring that up? Because if Windows detects an open network connection to the PC, it will not allow it to sleep. That is good (because you don’t want network connections arbitrarily being dropped) but you need to understand that if you are trying to understand why your computer isn’t sleeping. The Allow hybrid sleep setting controls how the computer goes to sleep. There are essentially two ways. One involves saving all of the RAM out to hard disc first and then putting the electronics into a quiet, low power state. The reason for saving the RAM first is so that if you have a power cut and the computer is turned back on after power is restored, it can still resume the sleep state from hard disc. This is called hybrid sleep. The other mode doesn’t save the RAM to hard disc but just puts the electronics into a quiet, low power state. This is the mode I use. The risk is that in the event of a power cut, any open files, etc will be lost and the computer will just boot from a fresh start. Again, for a media PC, that is fine. The reason I turned off hybrid sleep is because it takes time to save the RAM to hard disc; if you turn off hybrid sleep, the computer goes to sleep a lot faster. 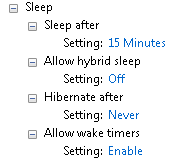 The Hibernate after setting tells the operating system when it should change from sleep mode into hibernate mode. What is the difference? Well, sleep mode has the electronics still running but in a very lower power state … but power is still being used. Hibernate mode saves all of the RAM out to hard disc (unless it has already been done if you are using hybrid sleep) and then turns off the electronics (apart from any bits that are configured to still wake up the PC like an Ethernet socket). Virtually no power is being used then. This isn’t really a good mode for a media PC because resuming takes longer so I’ve turned it off. The Allow wake timers setting ties in with scheduled tasks. It essentially says that the OS needs to wake up from sleep if a task tells it to. This is very important for Media Centre … particularly if you want your programmes to record! This needs to be left at Enable. I’ve not really been able to find out much about this setting. The text makes sense in that if you enable the setting, it allows the OS to suspend selected USB devices. What this means is that if a USB device is capable of being turned off and on at a whim, the OS can do so and therefore save power. So, in theory, you could set this to Disabled and all will be fine. There are some forum postings I’ve read, though, that suggest this should be set to Enabled, as I have it, in order to ensure sleeping works properly. One thing to understand at this point is that it is possible for hardware devices to prevent the OS from putting the computer to sleep. Unfortunately, it can be somewhat difficult to understand or diagnose this but I have got a trick up my sleeve that I’ll share in a future post. On my media PC, there is a power button on the case. If the computer is running, pressing it will cause the PC to gracefully shut down, thus following the action defined against Power button action. If the computer is sleeping and I press the power button, it wakes up from sleep. It does not force the OS to shut down. That is how I wanted to work, so thankfully it does! I don’t have a sleep button on my PC but I have set the sleep button action to Sleep. I do have a remote control power button and pressing it causes the PC either to go to sleep if it is running or to wake up if it is asleep. Again, this is how I want it to work. This power setting, like USB selective suspend, isn’t really relevant to Windows Media Centre or its operation but is relevant to power consumption so I’ve left it on the default of Moderate power savings. Processor power management is quite an interesting one to look at. I’ll tackle the middle setting first – System cooling policy. It can be active or passive. Active means you’ve got fans in the system and the OS will work with the fan hardware to control the speed of those fans. Passive means that there aren’t any fans (which there aren’t in my PC) and the OS will work on the processor speed in order to control the amount of heat being generated. The faster the processor goes, the more power it consumes and the more heat it generates. Therefore, it is good to allow the OS to slow down the processor whenever it can as this will consume less power and generate less heat. The minimum and maximum processor state values dictate how much throttling the OS is allowed to apply. In the settings above, the OS can set the processor to be anywhere between 5% and 100% of its permissible speed. The maximum frequency information is the processor state that the OS has limited the CPU to. As my media PC is connected to an A/V amplifier and a plasma screen, both of which get turned on and off manually as they are required, I’ve set the OS to Never turn off the display output since it wouldn’t help me if it did that. The setting for When sharing media is an important one as it needs to be considered if your computer isn’t going to sleep. Although the value I’ve used may seem not to be the correct value, it may help if I explain what exactly happens here. Remember that I said earlier that Windows will not put the computer to sleep if there is an active network connection to the system. The When sharing media setting does not mean actively sharing – it means if the computer is set up to share. In other words, if you run Windows Media Player and configure it to share media across the network, your computer will never go to sleep unless you change this setting to the one shown. For When playing video, I chose Optimize video quality because that is of paramount importance where the media PC is concerned. That is the complete list of settings. I hope you’ve found this useful. Just to clarify, if I run a Windows 7 machine purely as a HTPC, I can set it to record a show, and then it is possible to then get the pc to sleep/hibernate and it will wake itself up in time to record? @David, correct. That is precisely the setup I have in our living room. The computer sleeps most of the time, wakes up about 4-5 minutes before a recording is due to start, records and then goes back to sleep almost straight away if there isn’t anything else going on. 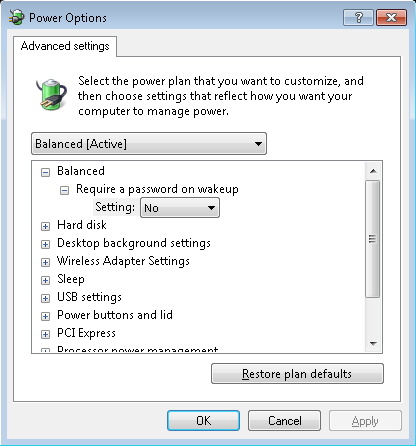 Sleeping and power settings can, however, fail to work properly if the hardware drivers don’t implement sleeping properly. My strongest recommendation would be to get well known brand items like an Intel motherboard and stick as close as possible to just that. If you are using the PC just as an HTPC, try not to install too much else and it should work really well. Thanks for posting this! This is exactly what I was looking for when I wanted to fine tune my power settings for my HTPC running Windows 7. Thanks ….Just set up my HTPC at home. You saved me a lot of experimenting. I found a lot of the details and explanations that you included very helpfull. Thanks for a great post. thst little trick about when having been set up to sharing was a troublesome one for me. Now if I could just tell it to put the LCD monitor to sleep after 10mins but not the projector display to sleep (ever), I would be golden…the PJ is the extended desktop where media center displays to by default…the LCD is a touchscreen interface that resides on my equipment rack. Great stuff – thanks for the info, very helpful – you pulled the curtain back nicely here for me to understand what is truly going on! Great stuff, thanks. Am I understanding it correctly that the ‘wake timer enabled’ only works for sleep mode? I’d like the HTPC to hiberate, then start up when due for a programmed recording. Possible? Hi. No, the wake timer will work for hibernate, which is really just a “deeper” form of sleep. However, the computer will take longer to wake up from hibernation, and it will take longer to go into hibernation, both due to the loading & writing of the hibernation file respectively. Is there a reason why you would prefer to use hibernation rather than sleep? There is hybrid sleep which saves the hibernation file and then just uses normal sleep. This has the benefit that you can switch from sleep to hibernation if the computer remains asleep long enough and can wake up quickly if it is still in sleep mode. The drawback, in my mind, is that it still requires the writing of the hibernation file which means the computer takes longer to turn off.